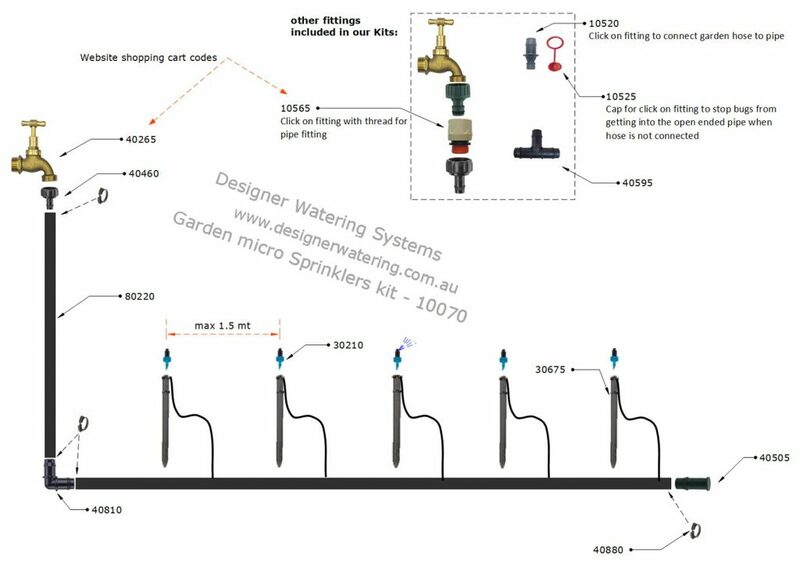 As the weather starts to warm up, we thought we share our tips for positioning garden micro sprinklers for maximum efficiency and coverage. Remember that all product codes listed on the diagram can be searched and added to your basket from the search bar at the top right of the page. The distance between sprinkler heads should be less than the radius of their throw. The sprinkler in the above diagram can comfortably throw 1.5 metres, so the next sprinkler should be no further than 1.5 metres away. If your garden is wide and you need more than 1 row of sprinklers, the next parallel sprinkler run should be no further away than 1 ⅓ times the radius of the smallest adjacent sprinklers (e.g. 1.5mt radius x 1.333 = maximum 2 mt to next parallel sprinkler run). Plants and trees can obstruct the sprinkler water, so closer is better if this will be happening. For more tips and information about all the products available, please take a look at our Components View page. Also feel free to call in to the store for advice on parts or to collect your gear in person.